This is for my own reference sometime in the future. 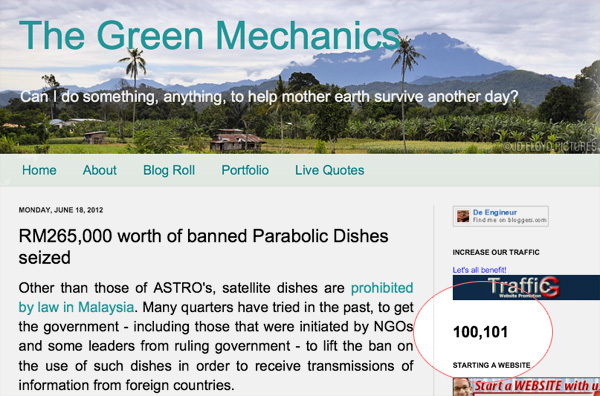 A couple of days ago this humble blog reached a tiny milestone, a 100,000 pagehits although I must admit is nothing compared to the seasoned bloggers like Teh Ramuan, Bluedianthus.com and Dunia Realiti, to name a few. A big salute to the senior bloggers as I take inspiration from their non-stop pursue in writing responsibly in the netizen. Let's continue writing in the hope of sharing info with others and at the same time improving ourselves through research/readings in the process. For the record, this blog is biased towards Green Technology, preserving the nature, preserving our cultural heritage and a bit of here and there to keep the mind tickled. I hope you never stop! This is one of the best blogs Ive ever read. You've got some mad skill here, man. I just hope that you don't lose your style because you are definitely one of the coolest bloggers out there. Please keep it up because the internet needs someone like you spreading the world..